Here is our heart for Musashi Kosugi (Muko), a quick overview of the state of mission there, and an explanation of our new church project and vision. Everything else in Musashi Kosugi (just say "Muko" for short) is already there. A dozen new 50-story residential skyscrapers crammed with people (SEE VIDEO HERE). And they're still going up! New malls, schools, hospitals, and community services. The Muko train station has the most crowded ride west of Tokyo Disneyland (SEE VIDEO HERE). But a church witness for these 120,000+ people (99% without Christ) is still missing! We believe we can change this reality with you. It's our joy to launch this new church planting project in Muko and invite you into it. You've been waiting for this project, right? You've been part of our lives, now we invite you to be part of Muko's future in Christ. The 1st floor is “store-front” space for our outreach ministries and new church to gather. Above is living space for ourselves/staff. If you've followed along with us, you know this burden for Muko isn't new (we've spoke of it since 2014), and it's not a change in our ministry. Rather, it is an expansion of our church planting ministry in Kawasaki, Japan (with WorldVenture). Denen Grace Chapel (our current church plant) will serve as the parent to this daughter church, even as we continue to provide coverage for both. See our Vision 2020 page for SW Greater Tokyo to understand our church planting strategy better. and sacrifice toward its birth and growth." Can you partner with us in Japan through this new church work by helping us reach this project's funding need? PHASE I (construction) goal has been fully met as of April 9, 2019. Thank you for your partnership! CLICK to give securely online here through WorldVenture. 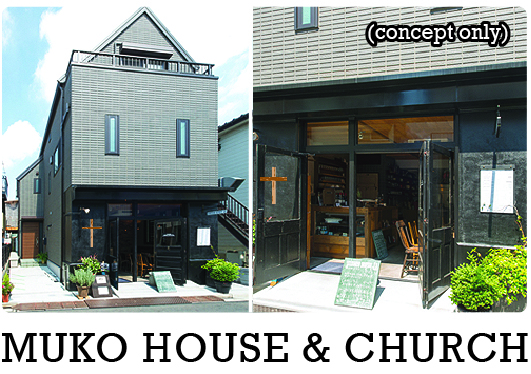 100% of all contributions given through this special project come to us in Japan, are tax deductible, and will be used exclusively for this Muko house/church project, with reporting and accountability within our mission. To give by mail, you may print and use the form here. This is the "prospectus" for this project which includes vision and rationale for this house/church in Muko, and plan for its use..
Catch the vision! View and download a 4-minute vision video for this project. This is effective in educating both small and large groups on the state of mission in Muko. How do we envision the church and house facility being used? Here is one example of weekly usage. You can view all of our email updates on this project below. The latest update will also have our current funding need listed. MAR 2019 "Tiny Chapel Designs"
JAN 2019 "Eyes Forward, Looking Up"
SEP 2018 "A Big Giveaway"
JUL 2018 "A New Church"
We know you may have questions about this project. We've tried to answer some common ones. Please view this Q&A resource. This also shows the project's total financial picture and progress. Please spread the word. Think for a minute, "Who can I pass this information along to that might be of help to the Lavermans in this project?" We need your networking help to bring the cross to Muko. Email this website URL, or click the thumbs up icon in the lower left corner.